A dark surreal modern day fairy tale. I'm not talking about a ìnew takeî on fairy tales like the new movie "Enchanted" where the heroine gets a dose of reality. The BIGGEST reason why we watch movies and anime is to escape from reality, not get back into it. I want to see the heroine with the heart of gold surpass every obstacle that gets thrown in her way. I want to see love, love found, love fulfilled, and most of all, love realized. 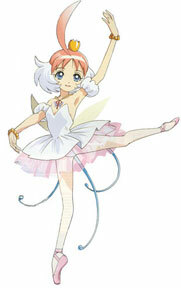 Alright, it sounds like Princess Tutu might be a really sappy mushy show with singing and dancing people and animals. 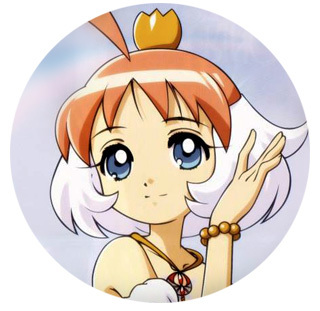 Princess Tutu does have dancing people and animals (the two items are separate, no dancing-animals) but it is nowhere near sappy, nor mushy, nor (Thank God) does it have singing animals. It borrows a great deal from the classic fairy tales and weaves them together beautifully using three main stories: The Nutcracker, Swan Lake, and The Ugly Duckling. Having a story the revolves around a heroine that is in a ballet school takes full advantage of all the gorgeous music from the two most famous ballets ever and who doesn't know the pain of the poor ugly duckling who in the end finally found a place that he belongs in. Duck, our heroine, (yes, they named her Duck, no beating around the bush) is probably the most klutzy ballet student that has ever existed and she just so happens to fall in love with a Prince, Mytho. 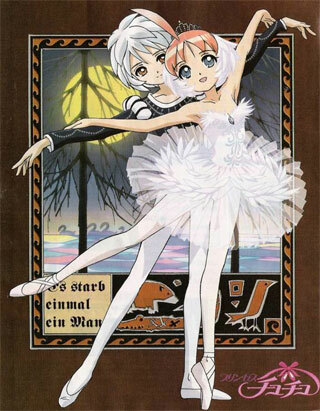 Mytho has lost his heart and Duck is charged to find the pieces back for him by a crazy dead guy that gave her the power to turn into Princess Tutu. Problem is that he has a girlfriend already and Rue is the most beautiful and elegant ballet student ever. 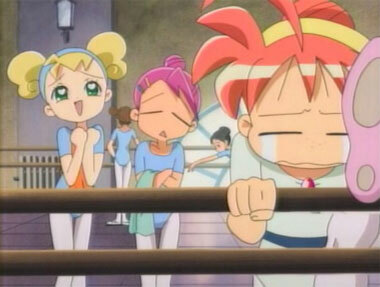 If that isn't bad enough, even if Duck does gets past Rue, she has to get past Mytho's bodyguard/best friend, Fakir, as well. Even if she gets past all these obstacles, she can't be with Mytho because to do so would mean that she has to tell him that she loves him and if she does that, then she'll vanish into a speck of light and cease to exist. 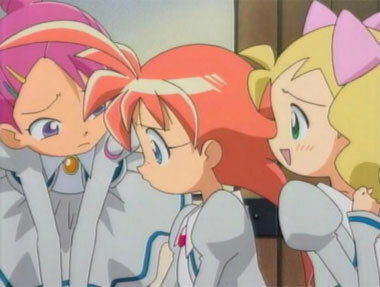 Perhaps it is the season: the end of the year and everyone is evaluating how their year went and how they want their new year to begin, but this particular anime has a more poignant feel because of it. Princess Tutu's darkness and helplessness but at the same time reminding us that sometimes, despite the bleak results that we know have passed or will come, the beauty of the journey and purity of our hearts make it all worthwhile. Maybe the results would not seem so bleak once the journey is over? Maybe the results only seem bleak because we were not told the result we want to hear? It is rare for me to skip my favorite pastime of sleeping for an anime but this particular one is worth the panda eyes, money for coffee, and most of all, waking up too late for breakfast. Get it. 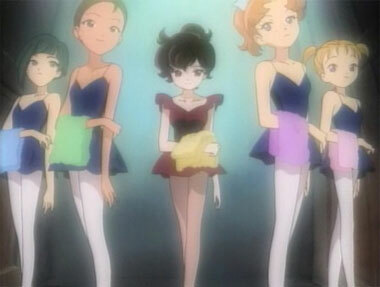 Below: Scenes from Princess Tutu. 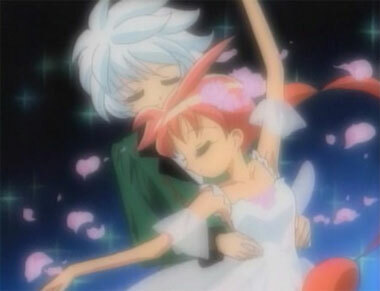 Below: The opening titles for Princess Tutu. 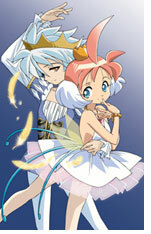 Below: Promotional art for Princess Tutu. 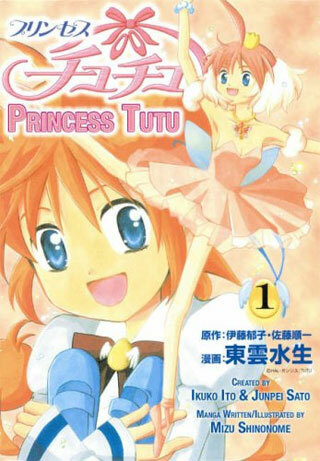 Below: The manga cover for Princess Tutu.